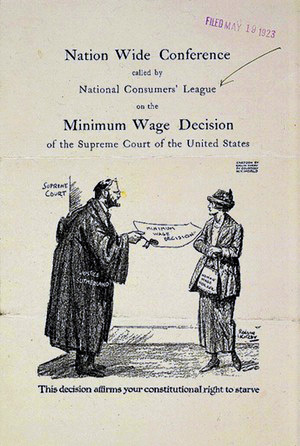 On April 2, 1923 the Supreme Court declared a Washington, D.C., law establishing a minimum wage for women unconstitutional, saying it violated the “due process” clause of the Fifth Amendment. The Adkins v. Children’s Hospital 5-3 ruling (with one abstention) set up battle lines in the Supreme Court between progressive reformers versus reactionary free marketers, which would play out during Franklin Delano Roosevelt’s New Deal administration. Four of the five justices in the majority became known as the “Four Horsemen” declaring unconstitutional government efforts to create jobs and help farmers, workers and families during the Great Depression. 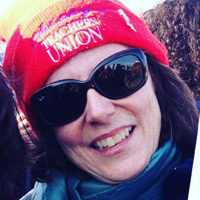 Mass movements demanding economic relief and labor rights grew, and in 1937 the Supreme Court declared constitutional a Washington State minimum wage law in West Coast Hotel vs. Parrish. Today an overwhelming majority of Americans support raising the minimum wage to at least $10 an hour. In his recent State of the Union address, President Obama called for raising the federal minimum wage to $9 an hour.